The Centerville-Washington Park District teamed up with youth athletic organizations in the community to provide AED (automated external defibrillators) stations for public use in eight community parks 365 days a year. This is the first installation of its kind in Ohio. 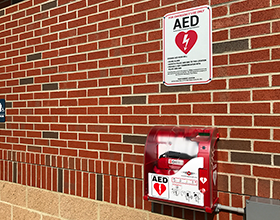 Originally announced in June, the AEDs have now been installed and are operational at Activity Center, Iron Horse, Oak Creek South, Oak Grove, Robert F. Mays, Schoolhouse and Yankee Parks. AED’s are planned at other park locations in the future, including Forest Field Park after an upcoming park renovation. A ribbon-cutting ceremony Wednesday, August 30 at 4:00 p.m. at Activity Center Park will celebrate this life-saving initiative. The $34,000 project was funded through the Park District’s matching funds program, which provides funds of up to 50% for park projects that benefit the community. The remaining cost was divided between the Centerville United Soccer Association, Centerville Recreational Soccer, Centerville Youth Lacrosse and the Centerville Wee Elks Football Organization. For more information about Sudden Cardiac Arrest and youth athletics, please visit the Youth Sports Safety Alliance (YSSA).